LASER THERAPY contains information not only for those involved in the field of lasers as medical doctors, but embraces all practicing clinicians including dentists, veterinarians and so on, basic and clinical researchers, students, all paramedical professionals and photo-optic engineers associated with any aspect of light and medicine. 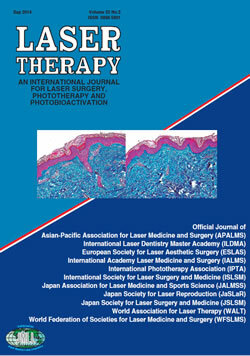 Contributions to Laser Therapy, an English language journal, will allow you to proliferate your own new ideas, insights and study results to an international audience, and learn from the contribution of others. Copyright (c) JMLL All rights reserved.